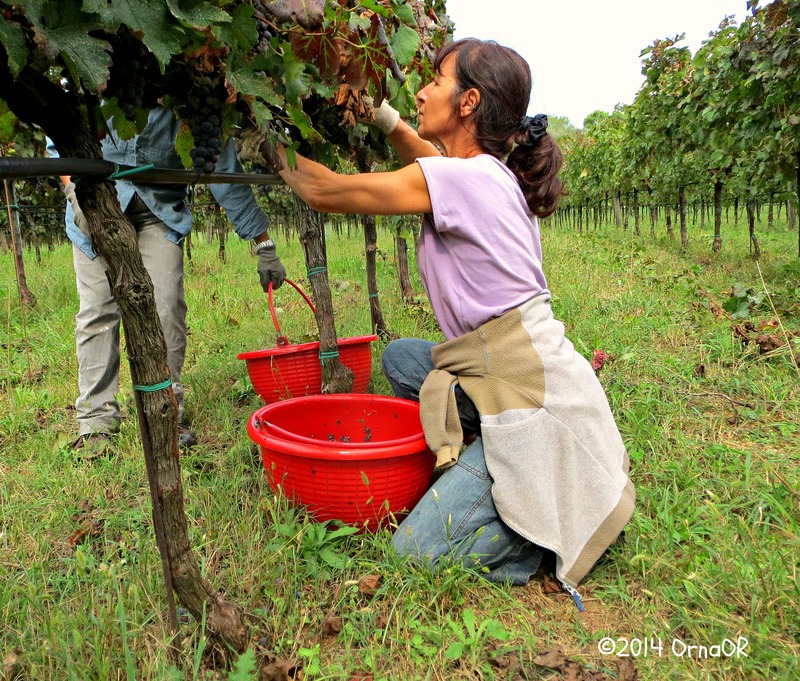 My personal experiences during this year’s grape harvest in the Veneto region of north eastern Italy. I live in wine country. 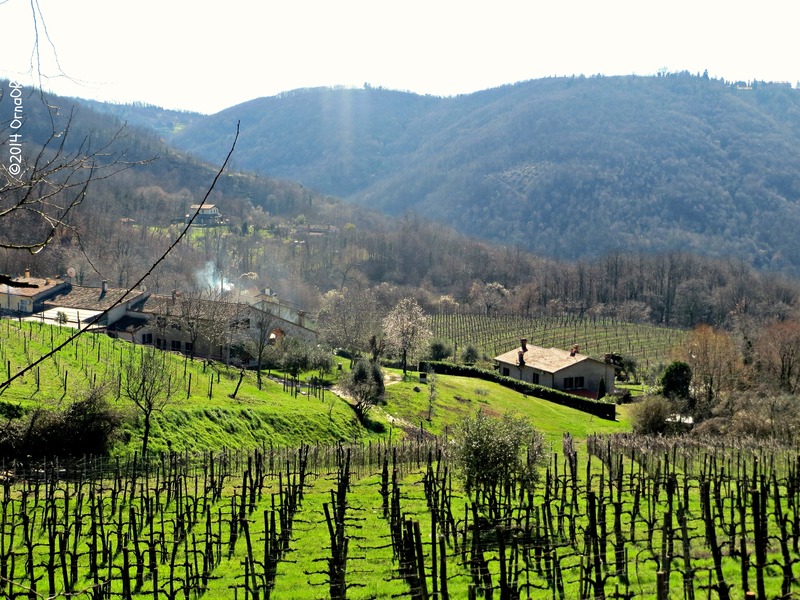 On my daily walks, I am lucky enough to be able to see the day by day effect of the different seasons on the vines that stretch for miles across The Euganean Hills here in the Veneto. 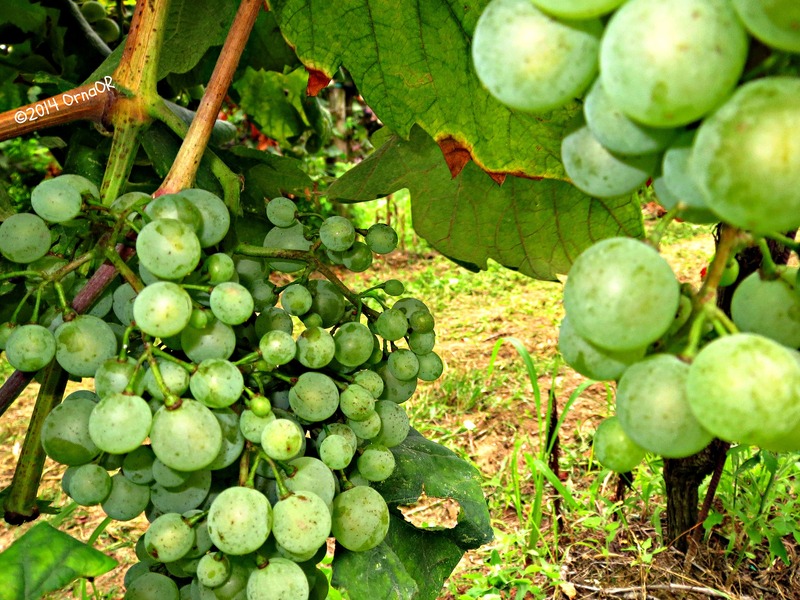 Bare, black and gnarled in winter and into the early spring, they turn leafy and brightly green in early summer as the grapes grow bigger and juicier under the hot Italian sun. Then September dawns and the narrow winding roads become busy with tractors pulling trailers full of bouncing grapes. Long, straight rows of vines, stretching as far as the eye can see, are tended to by men and women who cut the grapes by hand and lay them in their plastic containers, filling them to the brim, then emptying them carefully into the waiting trailers. Then off to the wineries they go. 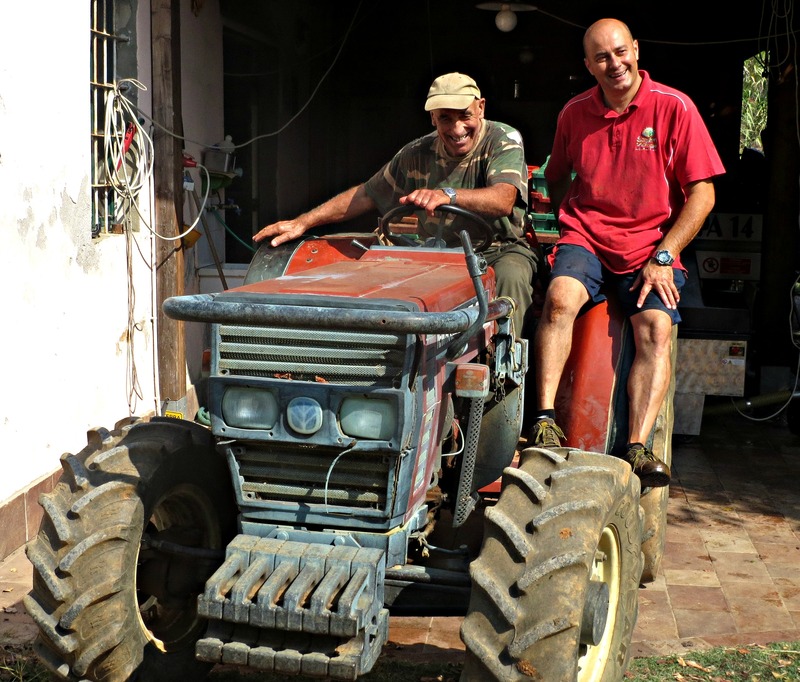 Large independent vineyards do their own pressing and bottling, but the big cooperatives handle this for the smaller farmers, one grape variety at a time. 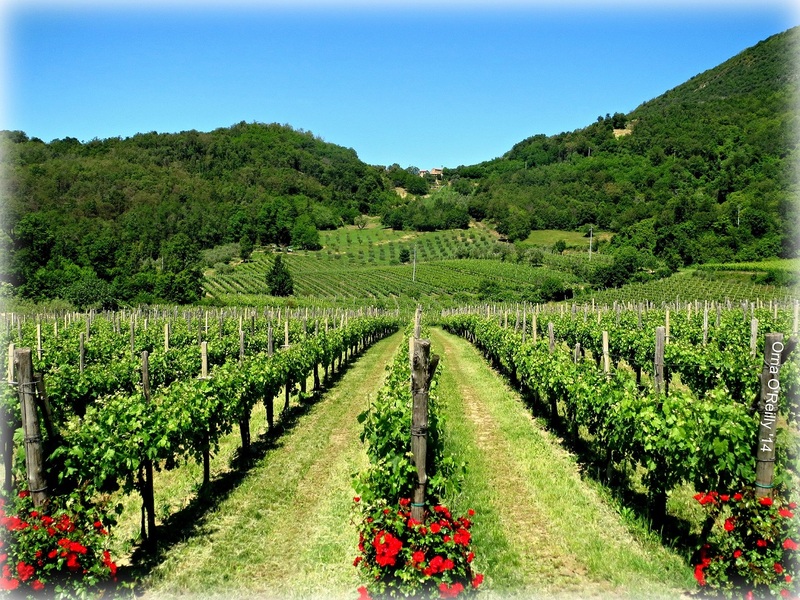 Here in the Veneto region – apparently the largest wine producing area in Italy – there were many anxious faces to behold towards the end of summer. An unprecedented amount of rain fell this year and – as far as I can gather – many acres of grapes were left to rot on the vines; judged too poor to harvest. 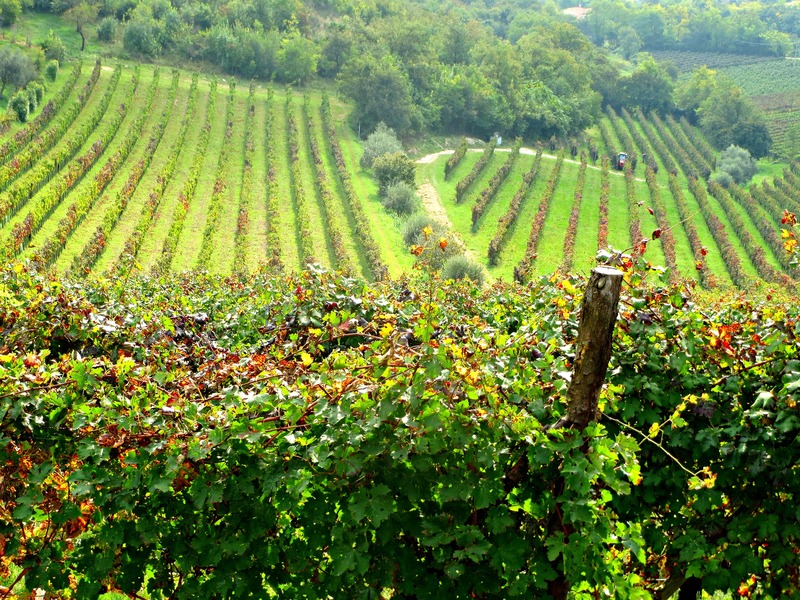 However, it appears that most of the crops were eventually cut and it will be interesting to see how good the 2014 vintage will be in this part of Italy. I am keeping my fingers firmly crossed! 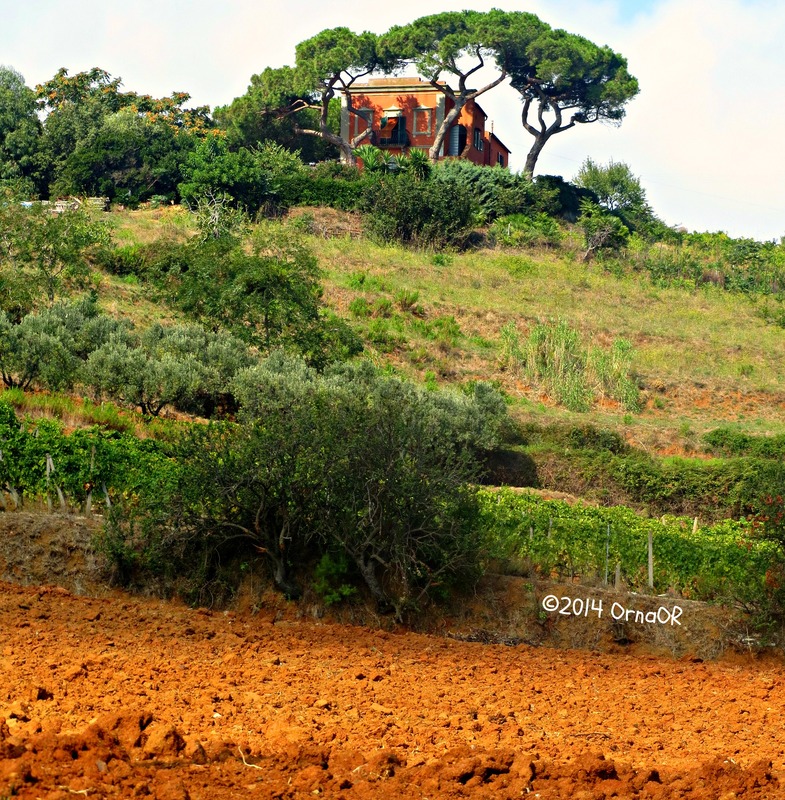 I recently visited the beautiful island of Elba off the Tuscan coast (read my blog post HERE) and the grape harvest was in full swing with a good yield in the offing. 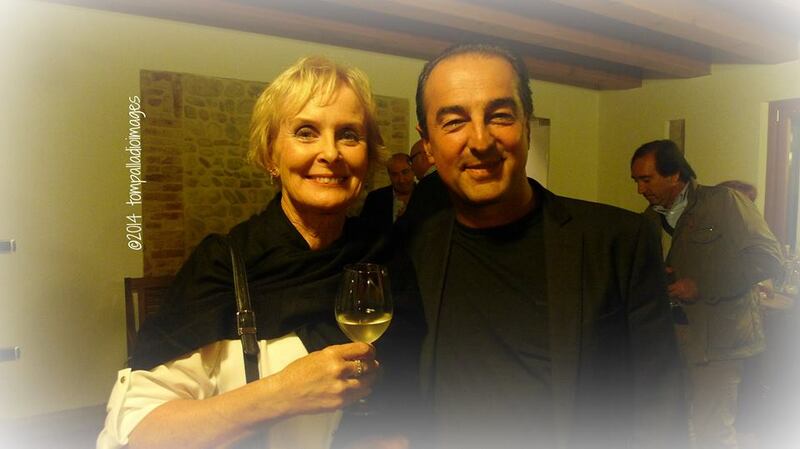 I paid a visit to Arrighi wines owned by Antonio Arrighi. This is a small vineyard; tiny when compared to many of the huge estates here in the Veneto, but it was lovely to visit with such a charming family who were bringing in their grapes under the hot Mediterranean sun. In mid-September I was invited to attend the harvest festival at Bottega S.p.A. in Bibano di Godega di Sant’Urbano in the province of Treviso, Veneto. 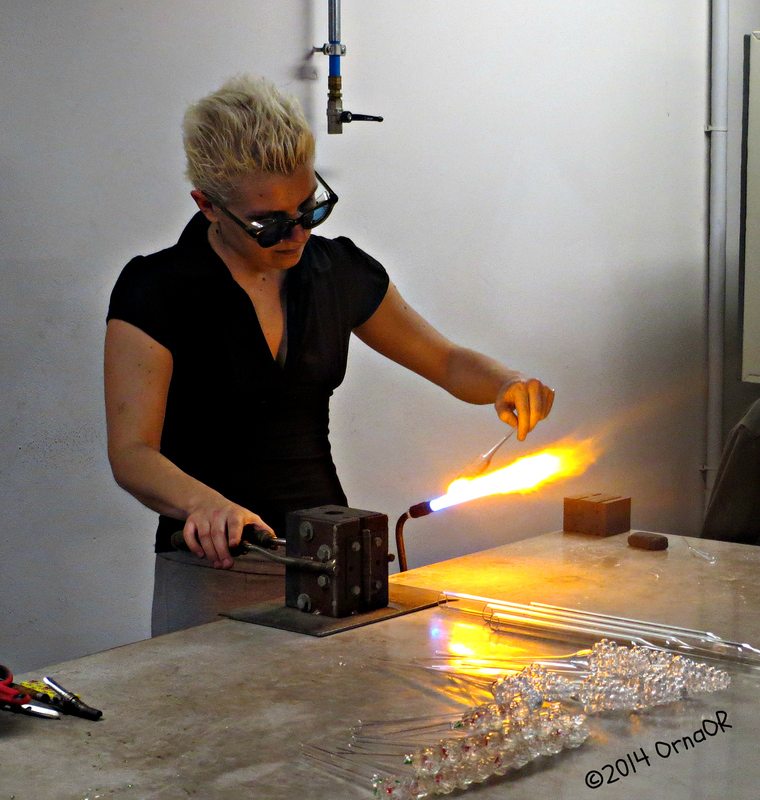 This was a full-on affair with buyers from all over the world (and me!) being entertained lavishly. 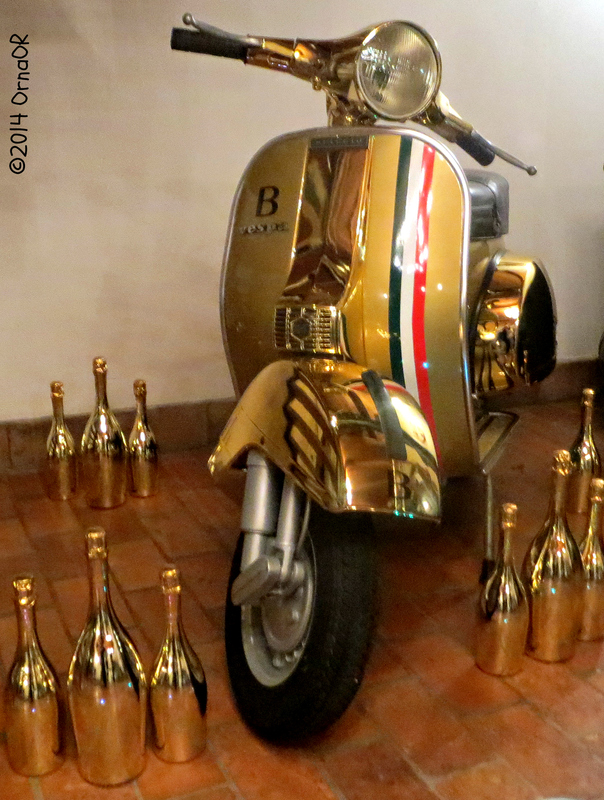 First of all, we trooped en masse into the factory, where Bottega’s signature bottles are individually made. These are really beautiful and can definitely be classed as collectors’ items. 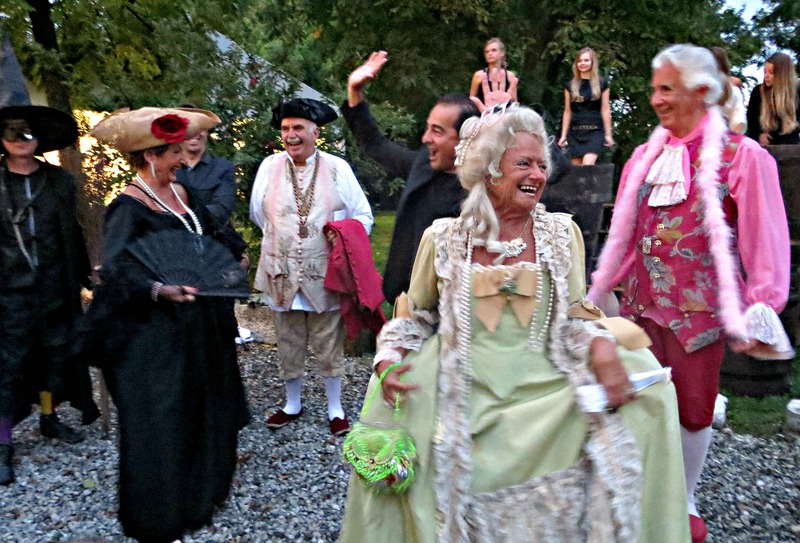 Later that same evening, after being collected by coach from our hotel, Villa Luppis where our hosts had generously organised our overnight stay, we arrived at the characterful headquarters of Bottega S.p.A.
Greetings were performed by a troupe of lively entertainers in eighteenth century Venetian dress who mingled with the crowd while the first grapes were pressed underfoot in a huge wooden barrel. Venetian acting troupe at Bottega vendemmia, with a blurred Sandro Bottega giving a “high five” and plenty of grape stamping going on in the background. This first press was then sampled by the electrically charged and enigmatic boss Sandro Bottega. So electrically charged, in fact, that I could not get a photo of him that was not a blur. However, he was finally persuaded to stand still for long enough to have my photo taken with him. 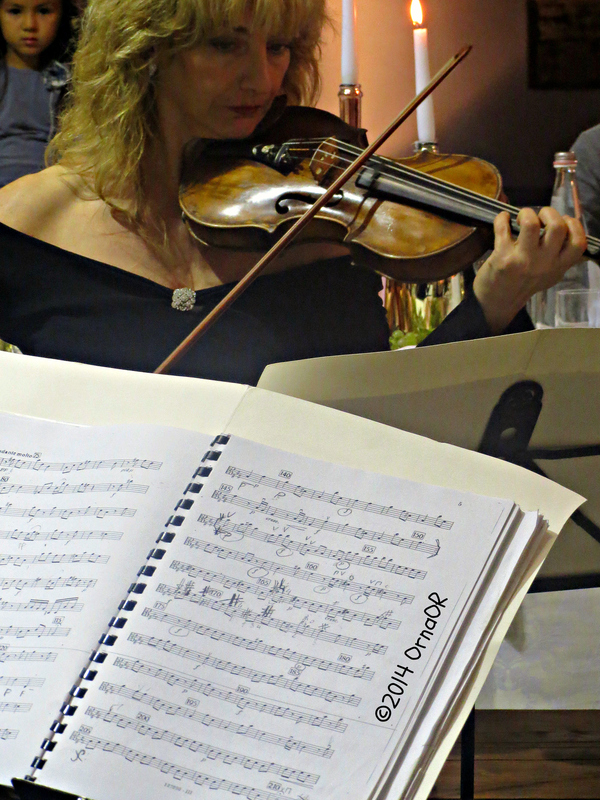 Dinner was next, served with great style in a marquee, during which we were serenaded by a trio of musicians – two violinists and a cellist – whose rousing renditions of Vivaldi and more, kept us entranced while we enjoyed more than a taste or two of the delicious food and wines. Salute! 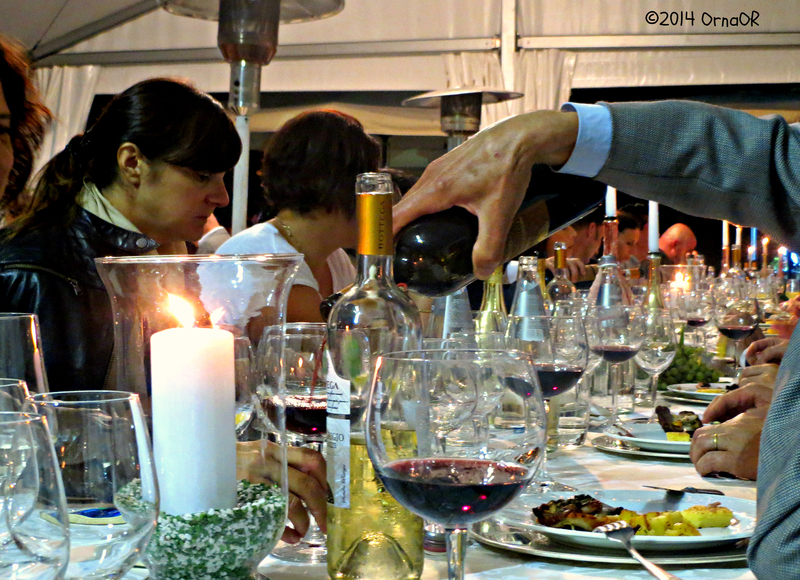 Dinner at the Bottega vendemmia, where wine was flowing. 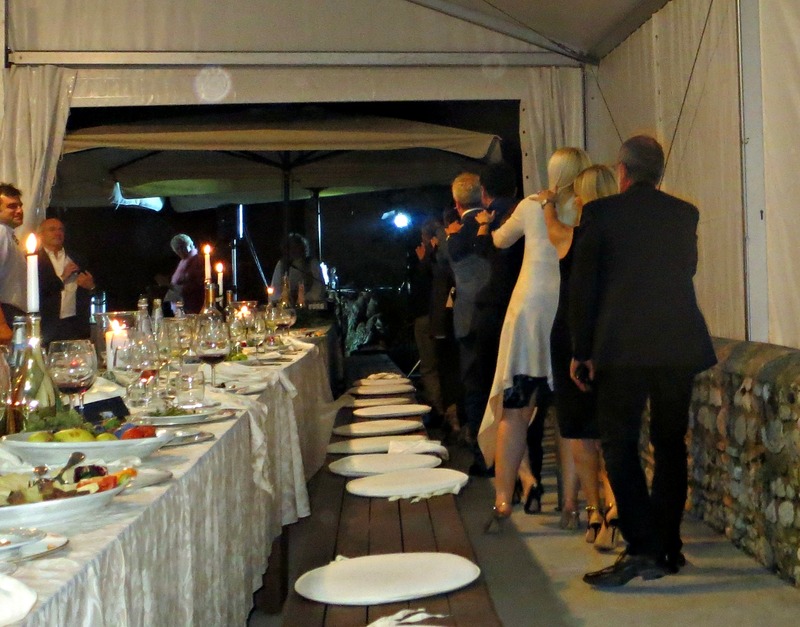 Conga line at Bottega vendemmia; things were getting a bit out of hand! 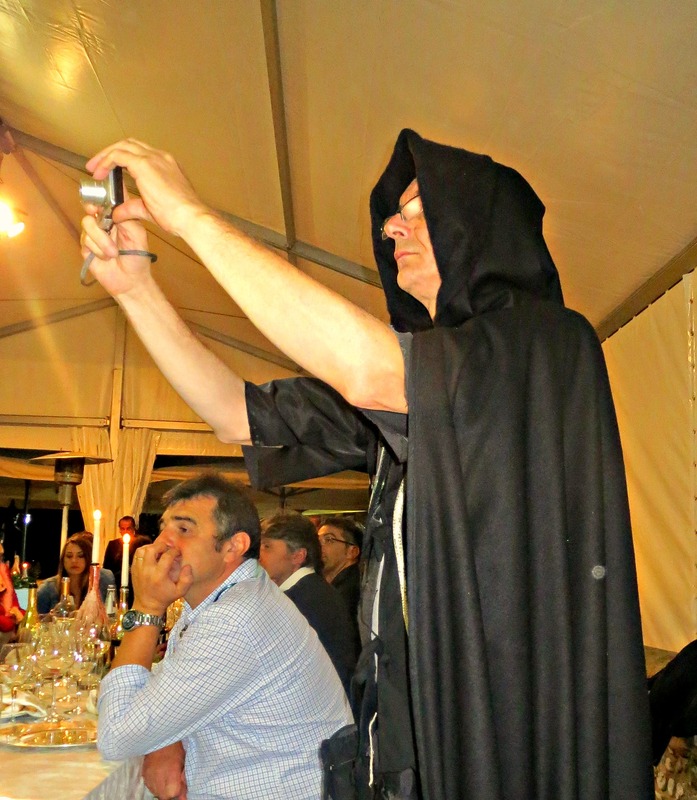 Strange happenings at Bottega harvest festival dinner! 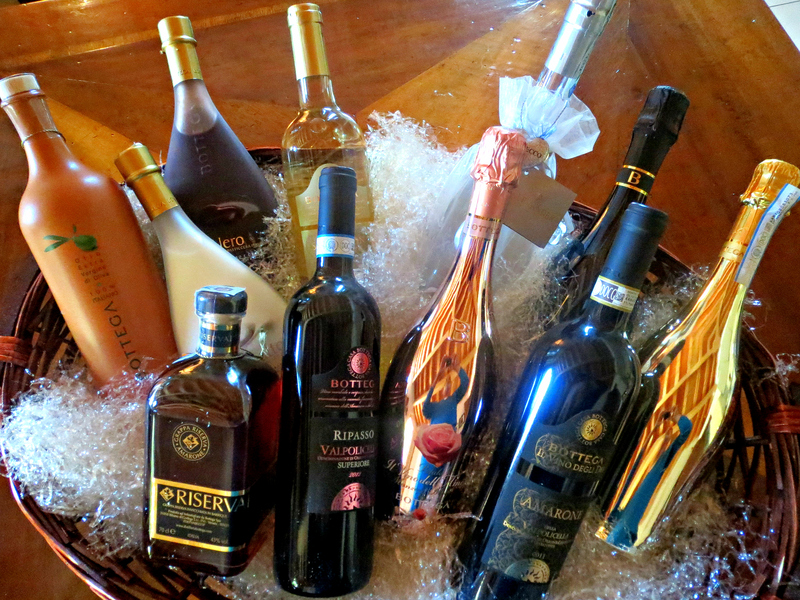 A generous basket of wines, grappa and olive oil were presented as we left and I am carefully working my way through its various contents. I’ll report back on my progress! 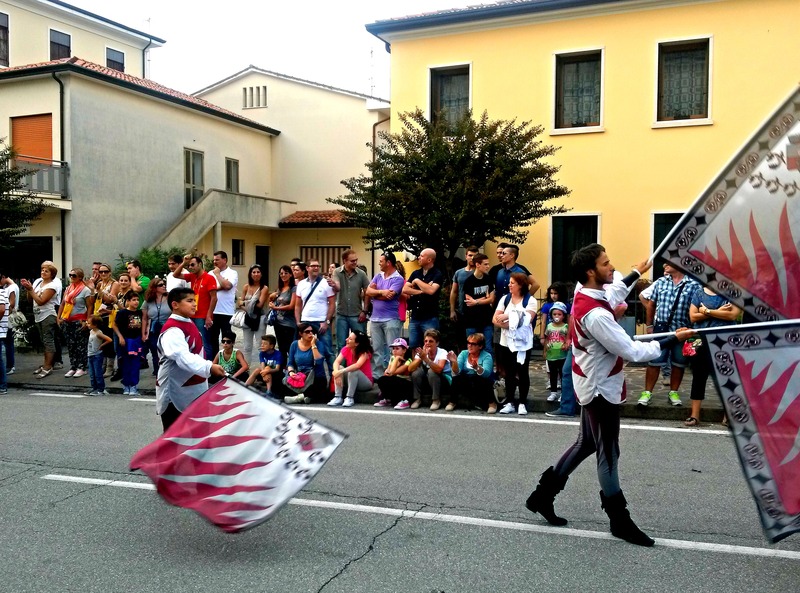 My next experience of La Vendemmia was the annual festival in the nearby town of Vo, where the many wineries celebrate the grape harvest with a parade. 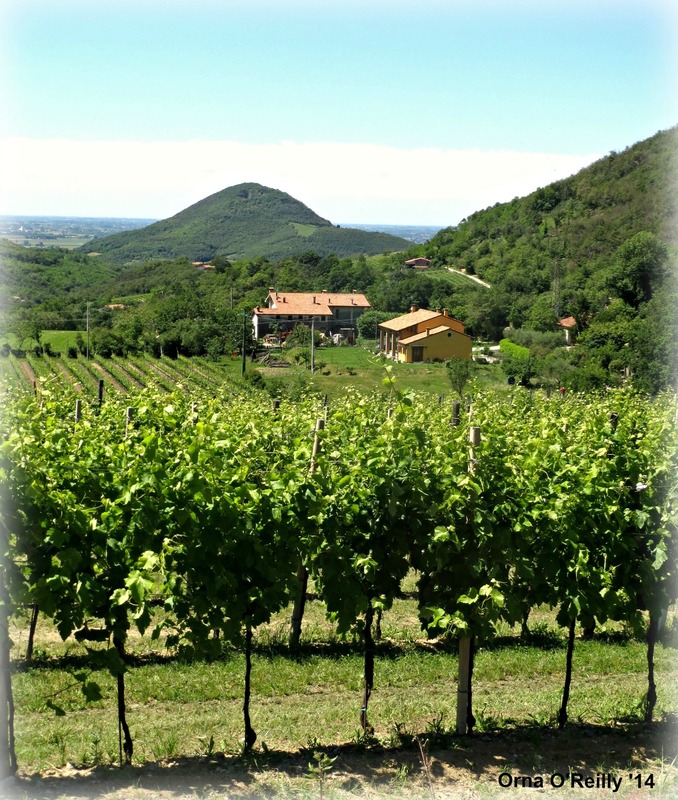 The main cooperative here is Cantina Colli Euganei. For €7 you could purchase a canvas purse to hang around your neck in which to place a glass and vouchers for tasting wine, cheese and salami. All great fun, but very hot, loud and jam-packed with enthusiastic locals, of which I am – technically – one, of course. However, it seems as though I do not possess the same robust constitution and stamina as my neighbours, as I flagged quite early on and had to go home for a lie-down. 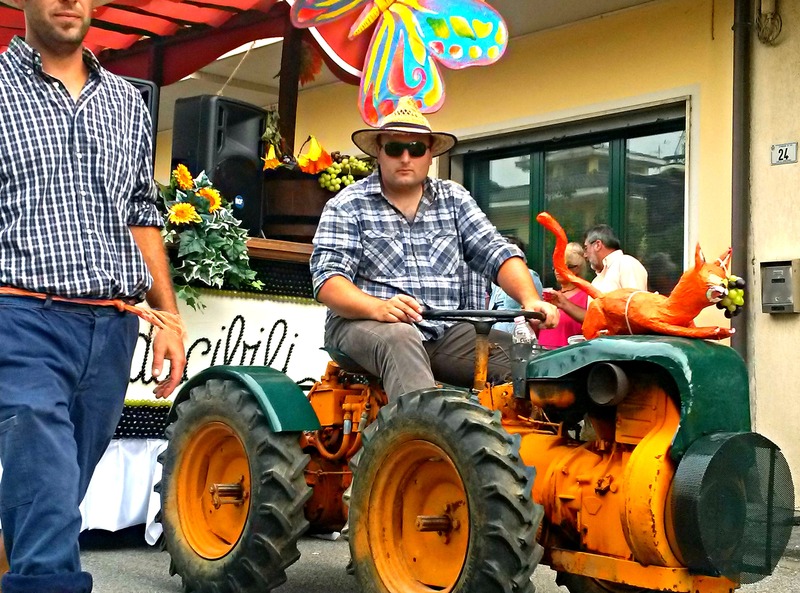 Wine festival parade in Vo: a man, his tractor and his grapes. Me at the Vo grape festival: hot, tired and ready to go home! 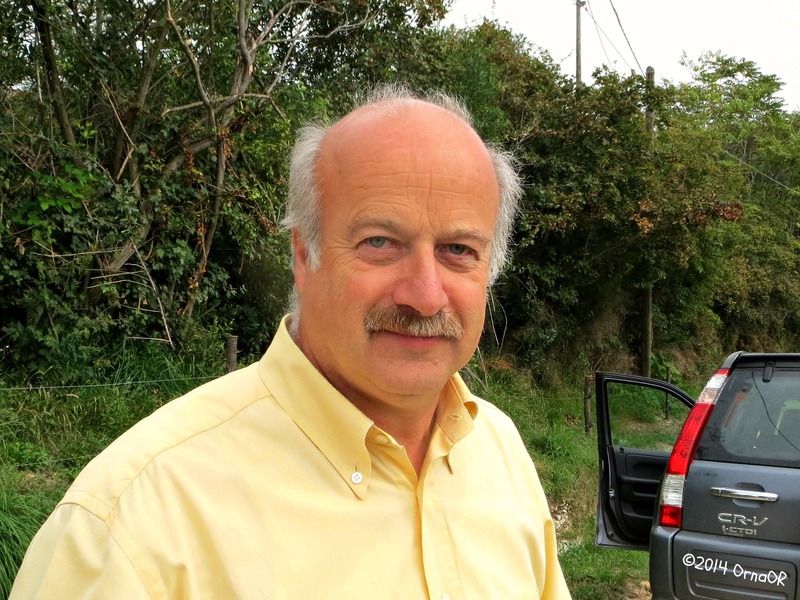 To round off this year’s harvest, I was invited by Franco Zanovello, boss of Ca’ Lustra the large organic wine producer in The Euganean Hills, just up the road, to go to Arqua Petrarca to see the cutting of the Merlot grapes. I jumped at the opportunity and was shown around by Franco himself. It was a warm, overcast morning, slightly misty, as I wandered around taking photographs of the luscious Merlot grapes being carefully cut. 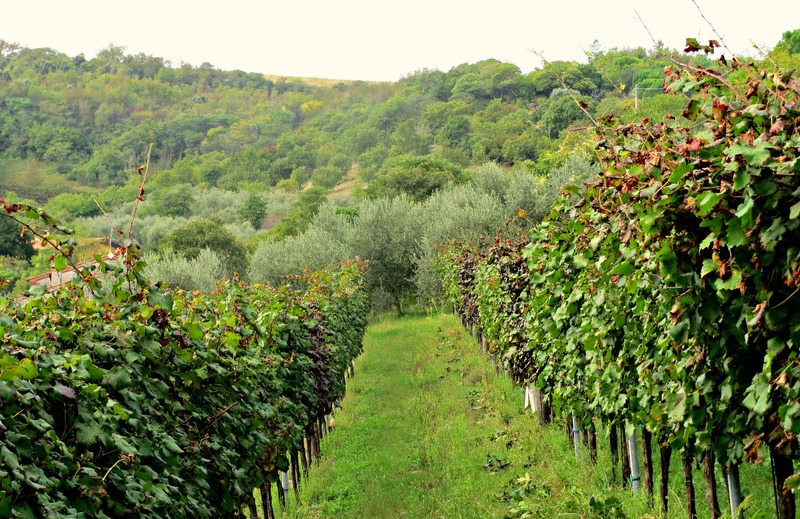 Spending some time strolling through an immaculate vineyard in The Euganean Hills seemed a fitting end to my own personal experience of La Vendemmia. Now it’s late October and the grape harvest has finished for another year. 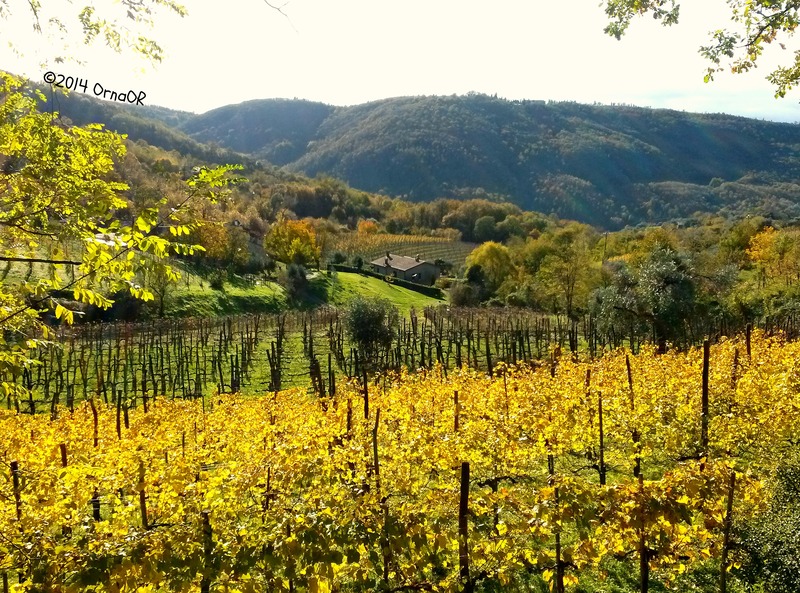 Vine-leaves have begun to turn to gold, as I continue my walks among the bountiful vineyards of northern Italy. You outdid yourself in this start-to-finish blog. Nicely done. Salute! Thanks Tom. So glad you liked it. Salute yourself! Great authentic experience, Orna! 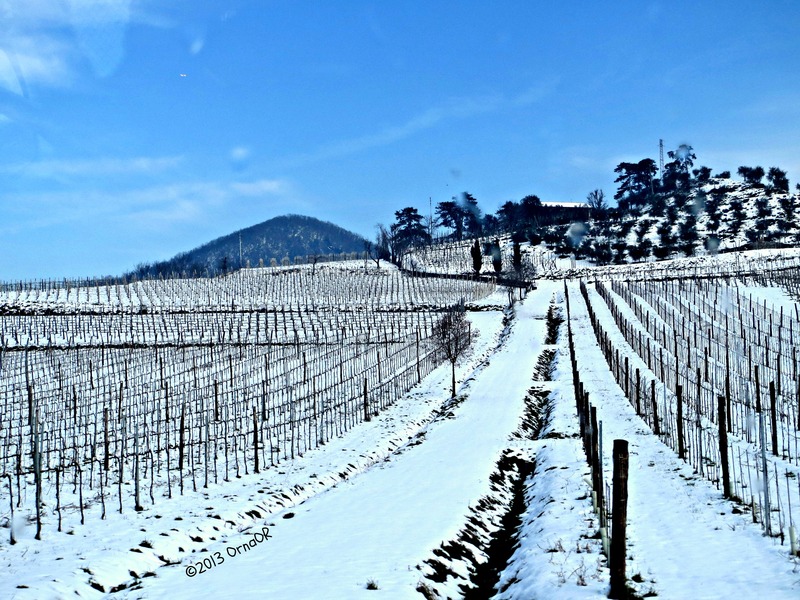 Beuatiful shots of vineyard at every season. Thanks so much Tatiana. Glad you liked it. Oh how lovely! I’ve just found your blog and cannot wait to read every word! Salivating here!! All the lovely images and meaningful words to go right along with them. It’s like reading a new chapter in a book about Italia every time I come here! 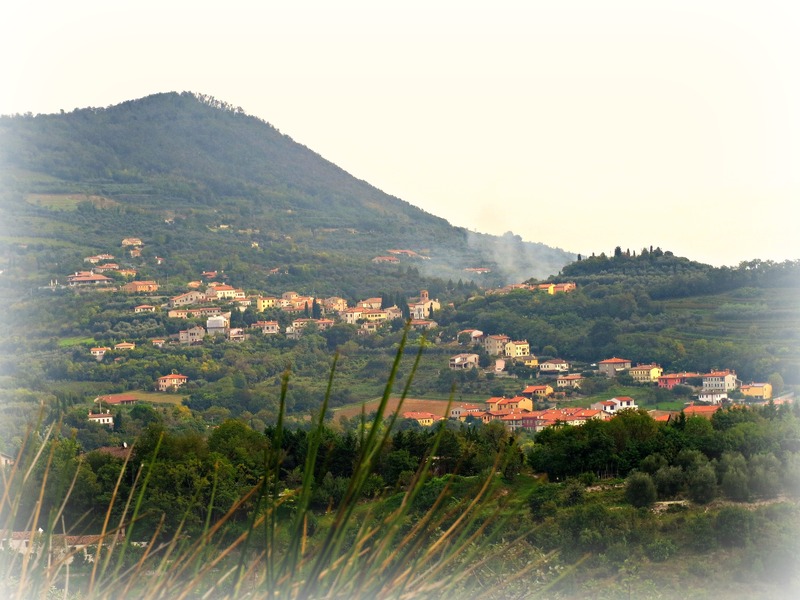 I spent 8 weeks in 2012 traveling the country of Italy….all by myself! In fact, it was my 35th wedding anniversary gift from my husband. What? you say….a trip alone for an anniversary gift? He knew how badly I wanted to find myself. We had been to Tuscany a few yrs earlier when he tagged along with me on a photography seminar. He enjoyed it but didn’t want to go back. Me? Could go back every year. Seriously. And my time exploring, eating, drinking, walking, praying, meeting new friends…alone? Heaven!! So you can understand why I’m loving your posts!! I journaled my trip on a special blog, that is linked on sidebar of my regular blog. And have since made it into a book. Very special to me!! 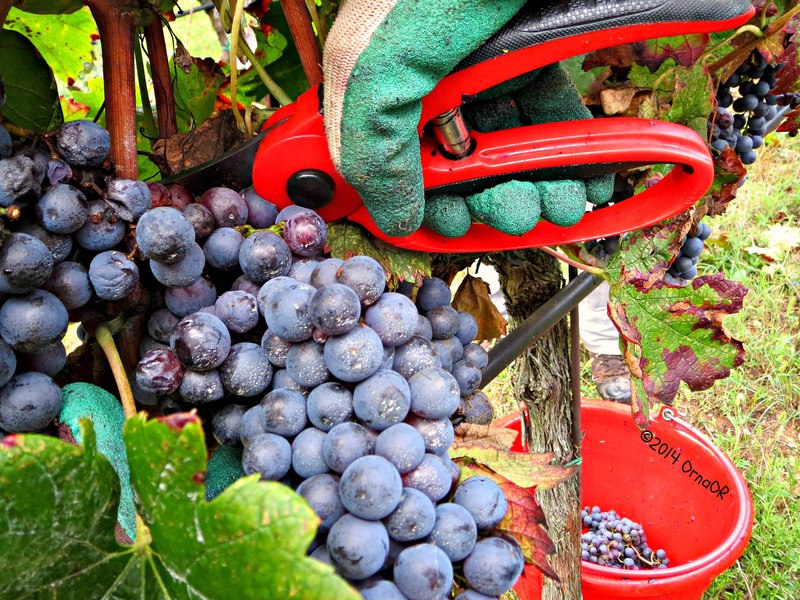 We just returned from three days in your region so I am thrilled to read about the harvest. Perhaps a goal for next year. Thanks Jenny & Stephen. It was all a lot of fun and glad you enjoyed my blog.